Press freedom around the world is in danger as journalists are threatened by government censorship, organised crime and commercial pressures. Online content is being controlled by a handful of internet companies whose processes lack transparency, and most countries restrict access to a range of websites. Donald Trump’s attacks on “fake news” in the US is also sending a message to authoritarian leaders that it is acceptable to crack down on the press. 259 journalists were jailed last year and 79 were killed. There were 426 attacks against journalists and media outlets in Mexico in 2016 alone. 6. 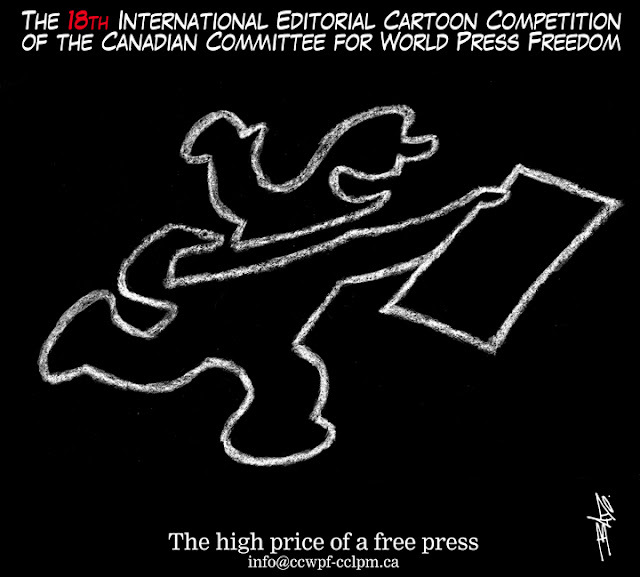 The Canadian Committee for World Press Freedom shall have the rights to use any of the cartoons entered in the Competition for promotion of our Editorial Cartoon Competition. 7. The winners of the Cartoon Competition will be announced at the World Press Freedom Day Luncheon held at the National Arts Centre in Ottawa, Canada on Thursday May 3, 2018 as well as being advised by e-mail. The winner’s names and their cartoons will be posted on the CCWFP web site.